There are a number of very important people at Vitulus who go to make the stud the success it is.You will note that the majority are females so its definitely ‘Chicks Rule’ at Vitulus! Margo came from a rural background. In fact her family, nee Mort, is only one of two in Queensland to have held a poperty in the same family for over 150 years. Her passion is for genetics and using all available scientific tools to help progress the development of the breed. The strategic plan has seen the stud progress from showing to carcass competitions to development of its own award winning branded beef. 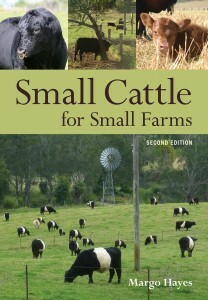 She is the author of the book Small Cattle for Small Farms published by CSIRO. John has recently joined Vitulus to replace Kimberly Rice who worked for us for seven years. Despite his young age John is an excellent cattlemen and we know he will succeed in the industry. He is currently completing his Certificate 111 in Agriculture. Julie and her husband Travis Iseppi, and daughter Macie, are the team that makes Vitulus win ribbons. Julie has that special skill of presenting our cattle to the best of their ability and our show record is proof of that. Whilst Margo feeds the cattle in preparation for the shows, Julie is in charge of show day presentation. A recognised judge and fitter, Julie has won the national Young Judges coompetition and the Queensland State Paraders Competition. Julie and Travis have been part of the Vitulus Team for over 12 years now. Dan is a recognised world expert in embyro transfer — his record being 92 embyros in one flush from a Brahman cow! Having lectured at Queensland University for a number of years he now has his own private practice and travels on a regular basis. 2007 Finalist in the Queensland Export Awards.